Alkaline solutions are used to clean food production environments but the role of alkaline resistance in persistent food factory contamination by Listeria monocytogenes is unknown. We used shotgun proteomics to characterise alkaline adapted L. monocytogenes recovered as persistent and transient food factory contaminants. Three unrelated strains were studied including two persistent and a transient food factory contaminant determined using multilocus sequence typing (MLST). The strains were adapted to growth at pH 8.5 and harvested in exponential phase. Protein extracts were analysed using multidimensional protein identification technology (MudPIT) and protein abundance compared by spectra counting. The strains elicited core responses to alkaline growth including modulation of intracellular pH, stabilisation of cellular processes and reduced cell-division, independent to lineage, MLST or whether the strains were transient or persistent contaminants. Alkaline adaptation by all strains corresponded to that expected in stringent-response induced cells, with protein expression supporting metabolic shifts concordant with elevated alarmone production and indicating that the alkaline-stringent response results from energy rather than nutrient limitation. We believe this is the first report describing induction of a stringent response in different L. monocytogenes strains by alkaline pH under non-limiting growth conditions. 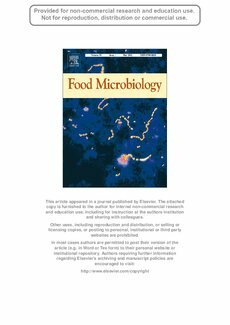 The work emphasises the need for early intervention to avoid persistent food factory contamination by L. monocytogenes.